First came Borat. Then came Brüno. What could Sacha Baron Cohen possibly follow up with next? Dictators, obviously. 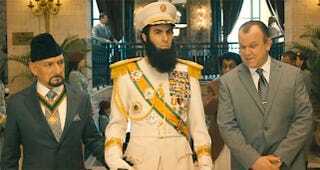 Cohen plays the fictional North African dictator General Aladeen, who "risks his life to ensure that democracy would never come to the country he so lovingly oppressed." Sounds like a riot. While I'm currently trying to wrap my head around the entire project, do share your reactions in the comments, please. I can't be the only one who wants to laugh but feels like it may also be "too soon."